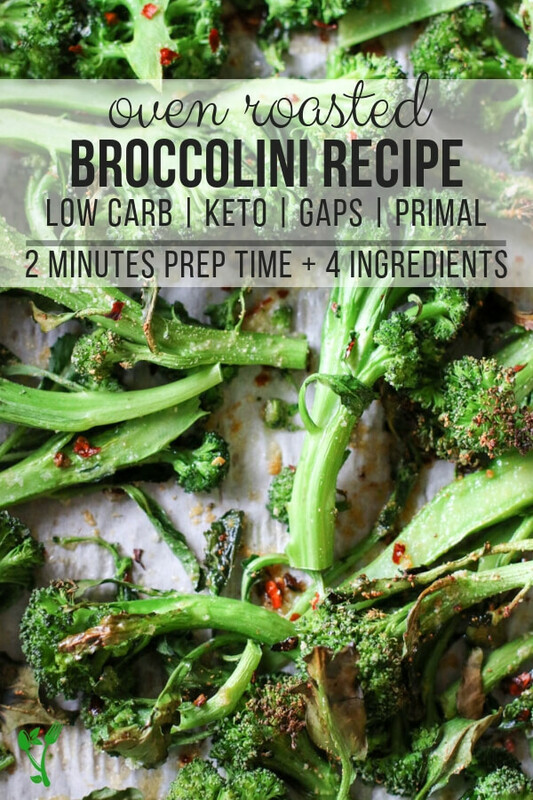 Add this Easy Roasted Broccolini Recipe to your weekly meal plan! 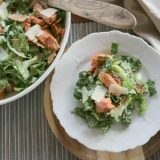 This stupid easy side dish consists of 2 minutes hands-on prep time and 5 simple ingredients. 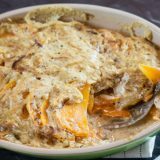 It’s low carb, GAPS, Primal, and overall a healthy side dish with very little effort. Sometimes the best side dish is also the most simple one. 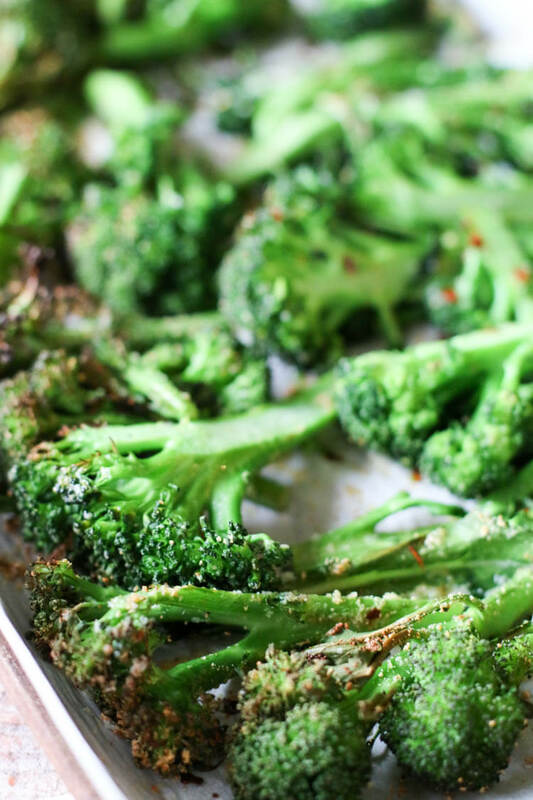 Roasted broccolini in all it’s glory and just a small handful of the best seasonings. 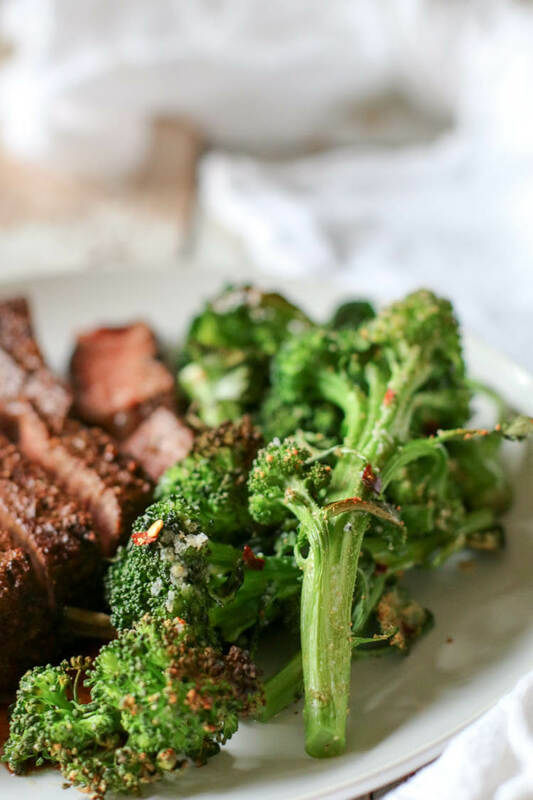 Truly, dinner doesn’t get any easier than some grilled grass-fed steak and a generous side of this beautiful, stupid-easy, delicious, and healthy oven-roasted broccolini. Broccolini is not baby broccoli. It is from the same family as broccoli but has smaller, tender florets and longer, thinner stalks. They are perfect for roasting! Broccolini is more milder than broccoli, with a sweet, earthy taste. 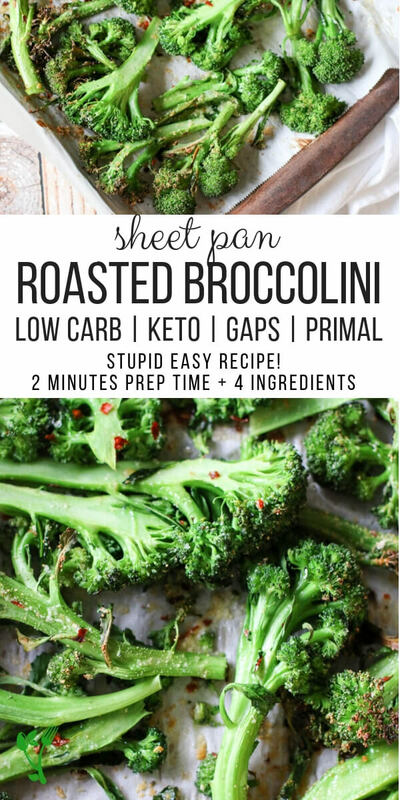 Unlike broccoli, this relative is best eaten cooked – whether sauteed or roasted. We love the addition of butter (continue reading for easy method – no melting required! ), red pepper flakes for some heat, freshly minced garlic and coarse salt. 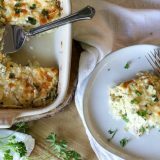 This side dish is incredibly easy but amazingly flavorful. The butter, red pepper and powdery garlic complement each other so well, you’ll be coming for seconds! Those browned tops of the broccolini are the best! My trick to getting that gorgeous top is to turn the broiler on low for the last 3 minutes of roasting. You’ll get hose golden-brown tops without scorching or overcooking this delicious vegetable. Butter is easier grated when cold. No need to mix the butter into broccolini – let the oven do the job – just be sure to grate the butter over the broccolini evenly. The last 3 minutes of roasting – turn the broiler on low for that golden brown finish, but keep a close eye to make sure it doesn’t burn as all ovens behave differently. To reheat, warm a cast iron skillet over medium-high heat, place the broccolini in the skillet and brown on both sides until warm throughout. 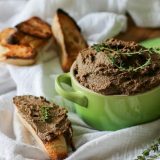 Related: Nourishing Foods Defined – read why butter is good for you! This is the coarse salt I use for most of my recipes, from Bone Broth to roasting vegetables. The best stainless steel rimmed baking sheet. I have a vast collection of my cast iron skillets, but this extra large one takes the cake. Tip: make sure the skillet is hot before reheating to avoid food sticking to the surface. 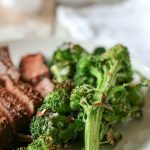 Add this Easy Roasted Broccolini Recipe to your weekly meal plan! This stupid easy side dish consists of 2 minutes hands-on prep time and 5 simple ingredients. 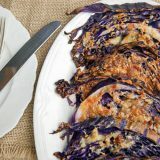 It's low carb, GAPS, Primal, and overall a healthy side dish with very little effort. Wash and and trim the broccolini. Cut the large pieces lengthwise, if necessary. Spread evenly on a rimmed baking sheet. Sprinkle garlic powder, red pepper flakes and salt evenly over the broccolini. Grate cold butter over the broccolini evenly. Do not mix. Roast in oven for 10 minutes. 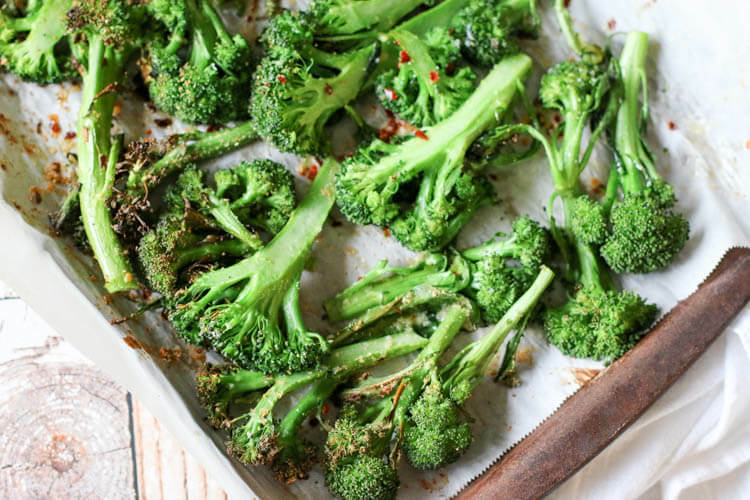 After the first 10 minutes, quickly toss all broccolini using tongs and return back to oven. Last 3 minutes of roasting time, turn broiler on low and broil for 3 minutes. Remove from oven and allow to rest 5 minutes. Toss together gently. Enjoy immediately. 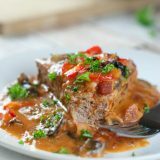 Can also be refrigerated and reheated on a cast iron skillet with butter or lard. ARE YOU ON PINTEREST? 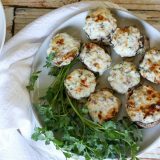 I PIN LOTS OF HEALTHY, EASY MEALS ON PINTEREST. FOLLOW ALONG! 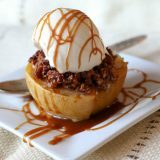 this recipe is so simple yet so delicious!